Prime Minister Peter O’Neill has pledged Papua New Guinea’s support of USD 1 million to the Marshall Islands for drought relief assistance. He made the commitment after the successful 44th Pacific Islands Forum held at Majuro, Marshall Islands last week. 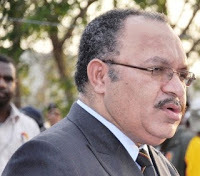 Prime Minister O’Neill, in making the commitment stated that PNG, over the last decade has continued to experience unprecedented economic growth due to investments in major resource projects in the oil and gas sectors and favourable commodity prices. “It is my government’s desire to share our development experience with our Pacific neighbours, inclduing the Marshall Islands, despite the many development challenges we are confronted with through offering employment for skilled personnel and investment opportunities and economic development assistance,” Mr O’Neill said. In a letter to Marshall Islands President Mr Christopher Jorebon Loeak, Prime Minister O’Neill thanked the President for the hospitality and the choice of the theme “Marshalling the Pacific Response to Climate Change”. Mr O’Neill said in his letter that there needed to be a collective, practical and meaningful effort regionally and at the international level to ensure climate change is effectively addressed now and in the immediate future. “In fact the Majuro Declaration for Climate Change Leadership provides the framework through which we can collectively work towards addressing this issue. We need to make the necessary adjustment and have the political will if the Pacific Plan is to achieve its overall objectives; while at the same time ensure we have an effective organisation that is delivering its mandate to the Pacific people and communities. closely with other Forum countries. “It is now the responsibility of our Ministers and officials to ensure that appropriate follow-ups are undertaken to implement these important regional initiatives and commitments.